See our TIP OF THE WEEK page for newer tips. The TIP OF THE WEEK came about through a facebook site my friend and I started, but I wanted to have them all in one spot. I’m re-posting the ones I’ve written before here on my blog, then will post new weekly ones in separate posts. I hope some of these help you as you paint with chalk-based paint. Follow my blog to get notified when I post new Tips of the Week. Update: A new tip of the week – using Saran Wrap with Citristrip! Check it out! TIP OF THE WEEK: Designer Knobs! I can’t wait to try this! This tip even includes all these designs! And it mentions If you use Martha Stewart modpodge, you could even wash in the dishwasher after 28 days. It’s that durable. Anthropologie worthy DIY cabinet or door knobs that look like hand painted designer ceramic knobs! Download beautiful designs to make your own set easily! I read about this seat on a blog called “Refunk my Junk” and knew I needed to find this as soon as possible. My knees and back really take a beating when I paint. The blog mentions you can find them at Tuesday morning. I didn’t have any luck in Cape Girardeau but I did find one at Lowe’s for $24.99. Can’t wait to try it out! TIP OF THE WEEK: Restoring Hardware – While searching for something else last night, naturally I found yet another thing. This little jewel will make you jump for joy when it comes to working with the hardware on a piece of furniture. It is a product called “Rub n Buff”. Sometimes you just want to keep the cool hardware but it just doesn’t go with the piece anymore or it is discolored and unsightly. Never fear…..you can restore it, too! You don’t have to buy expensive new hardware. I can’t wait to try Rub n Buff! 2. You can spray paint it…..I have found Amy Howard at Home’s white spray lacquer to work very well – makes it look like a piece of porcelain. Also, I’ve tried a metallic silver spray paint. 3. But last night I ran across a video of someone using Rub n Buff. This looks like a great way to finish hardware. I can’t wait to try this. I found you can purchase Rub n Buff online at Walmart and Amazon. But, I think places like Michael’s or Hobby Lobby may have it in their stores. You would have to check that out. It comes in a variety of colors. Here’s a link to the video I saw last night and a link to a question and answer on Rub n Buff. 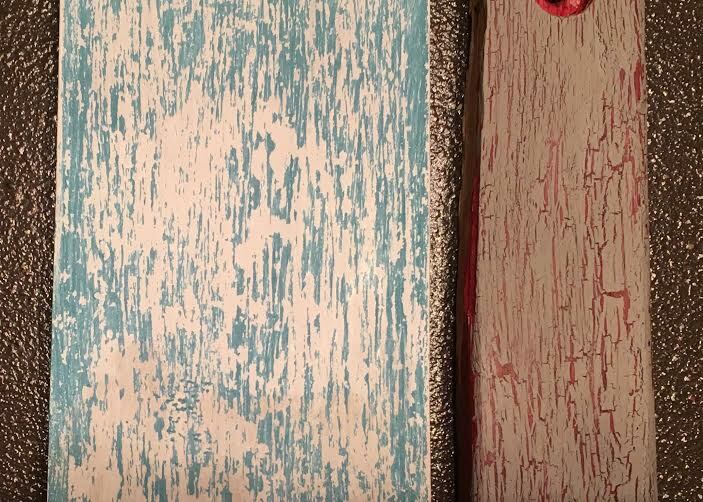 TIP OF THE WEEK: Video Tutorial – dry brush distressing technique over original finish. Enjoy! Note: This is a facebook video. TIP OF THE WEEK: I came across this site of a report about trending paint colors. It is interesting to note how many colors for 2016 trends are found in Missouri Limestone Paint Company’s Chalk-based paint. They work hard at staying on top of what colors are in fashion. We’re taking a close look at the 2016 paint color trends and forecast reports highlighting paint colors are predicted to be popular in 2016. TIP OF THE WEEK: Adding a graphic image….I’ve tried many different ways of adding an image to a piece of furniture, wood, or fabric – some with success, some were complete failures. When I came across this technique, I thought I might be able to do this. I haven’t tried it yet myself, but it does look doable. I think at the very least it would give you a good enough image to enhance with paint (for the artists out there) or to touch up with a paint pen or Sharpie. I think I might be able to do that. So, if anyone tries it before me, be sure to let me know how it worked, and post your result pics here! Enjoy! TIP OF THE WEEK: Great ideas for Upcycled Furniture. Over 20 of the BEST Upcycled Furniture Ideas – ways to turn Trash into Treasure! These ideas are a great way to repurpose old furniture & very easy to make! TIP OF THE WEEK: Vaseline distressing …. I love to try out news ways to distress and dshare what I learn. The last two pieces I’ve done, I wanted to get a chippy, shabby chic look so I thought I’d try vaseline as the distressing agent. I want to say this works perfectly and is very, very easy. 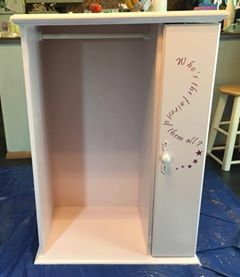 I was lucky, too, that the two pieces I wanted to distress were already dark wood, so I only needed one color of chalk-based paint. Normally, you’d want two colors, one a base coat, then the vaseline where you want it to go and then the top coat. I found this tutorial very helpful when distressing with vaseline. I used my finger on my first piece and a cotton swab on the second. I think a small artist paintbrush is what I’d use the next time to help give me control of the vaseline. Before I reveal a few tips I learned and show you how EASY it is to distress with this Vaseline technique, here’s the before and after and a few close ups. CHARMING! TIP OF THE WEEK: Baby wipes for distressing chalk-based paint….who knew? Of course, my chalk-based paint of choice is Missouri Limestone Paint, available at Gift Emporium & Cafe’ in Sullivan. : ) Watch for sales, use coupons, buy in bulk…..Dollar Tree also carries a 90-count package. TIP OF THE WEEK: Did you know you can paint those cheap white canvas shoes? They turn out great and are very quick to do. My grand daughter Lucy demonstrates how in this video. 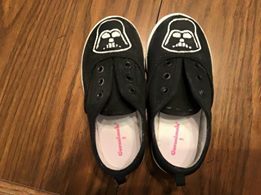 I also painted a pair for her brother Liam. I painted in the morning and he wore them by afternoon. Tip: Make sure the canvas shoes are plenty big. By the time we sprayed them with water and painted them, I think they might have shrunk a little, so get them plenty big enough. TIP OF THE WEEK: The Ultimate Redefined Tip: Taking Redefined to the next level….redefining a dead plant. I thought I’d share the painted pot/stick idea inspired by the botanical garden ones we saw in Germany. I just happened to have a plastic hen and chick pot (yes, you can paint plastic) left over from last year, complete with dirt and dead plant sticks already in place. How handy is that? I left the dirt to give it some weight. 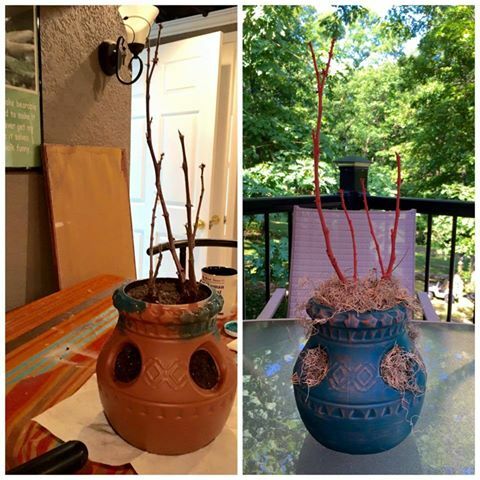 I painted the pot with one coat of Missouri Limestone Paint’s “Bourbon Street” then used the dry brush technique with a little bit of “Coral” on the pot and the sticks. TIP OF THE WEEK: (Posted by Michelle) Bleach is not my friend, but Sharsumpaint is. Well today started out with loads of laundry on my agenda. Several loads of white with Bleach. All went well until…I did a load of colors. Black, blue and grey. Simply loaded the washer, then.. added Bleach. To late…!! They were all a new style of polka dotted white & dark. Okay this got me thinking. First: I’am a idiot for doing this. 2nd tye dye clothing would be a little too much 70’s for all my pants. 3rd what can I do to fix this? Then…like a light above the head (I do see the light on this one) I remembered Sharon Strothcamp Sumner paints. I has re- painted a cushion, so maybe I could salvage some of my clothes. ( Not wanting to buy a new wardrobe do to being, Bleach happy) it worked! My tip is, if you splatter bleach or as I, Added it to all your clothes in the wash. Paint them. The result was fantastic. Simply spray the area you are painting then water down paint slightly, let dry completely and it is a set in color. I won’t share the picture of the clothing catastrophe. I will share the cushion. Before was a Ivory worn cover into a Coal Shovel (black) Sharsumpaint creation. TIP OF THE WEEK: Canary Street Crafts Blog is one of my favorite reads. This post is spot on explaining when to prep when painting with chalk-based paints. Enjoy and be sure to check out other areas of this site! Learn how and when to prep furniture before painting with chalk paint. I love my Silhouette machine for making stencils to use on the furniture I paint with Missouri Limestone Chalk-based paint. I can create just about any kind of stencil you can imagine…well within reason….as long as it is a pretty simple design. I will also sometimes, buy the design on Etsy, usually for a very reasonable price and cut it out on my machine. 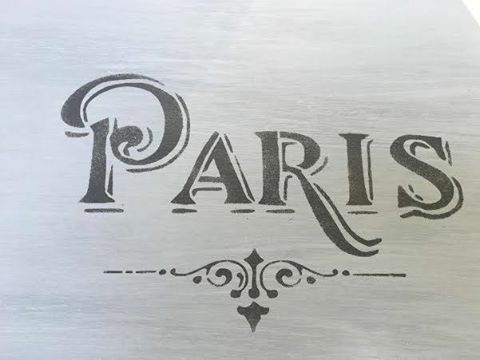 Another great source for plastic type stencils can be found at Gift Emporium & Cafe’ hanging on the door of the cabinet where our paint is on display. How handy is that! You can use a foam brush or one with bristles but they should be the flat across type. I use contact paper when creating my Silhouette stencils. Contact paper of today is not that sticky stuff from the past. Sometimes it is called adhesive shelf liner. It doesn’t matter the color or print. I can sometimes find it at Dollar Tree and keep it handy for making stencils. 1. Whichever type of stencil you use, attach it to your project….if a plastic one from Gift Emporium, use painters’ tape to hold it in place. It is important that your project has had time to cure, about 24 hours is best, to ensure the tape won’t pull up the paint. 2. Dip your stencil brush in the paint, and then dob it on paper towel. This makes sure you don’t have a lot of paint on your brush. Start on the edges and work your way toward the center, dobbing up and down, quickly. When you feel you have covered all you want inside the stencil, allow the paint to thoroughly dry before removing the stencil. This usually only takes about 5-10 minutes, depending on the thickness of the paint you applied. I sometimes hurry that process by using a hair dryer. Note: If you are using a plastic stencil over and over, be sure to wash it often so you don’t get a build up of paint that would allow new paint to seep under since it might not be laying flat anymore. 3. Carefully remove the stencil and…..your beautiful design will be revealed. I then use whatever topcoat I had planned for the piece, either wax or a poly seal. I’ve included several examples of projects I’ve completed, using a stencil. I want to begin by saying. Do not feel challenged by painting and re creating your own finds. I was totally intimidated by all this chalk paint chatter. The paint looked so beautiful on furniture, it had to be difficult, I thought. This is the wrong mind set. After Sharon literally placed the first sample purchase in my hand and directed me to go home and try it. I loved it. I believe my first thoughts were, this is so easy a monkey could do this. Not to down play monkeys. I do love them. The one thing I am trying to express is that you simply put one thin coat on let it dry, fifteen to thirty minutes, then re apply a second coat. Mission complete with a brand new style to a older worn out treasure. Anyone who can use a paint brush can easily do this. My tip is go create with this one of a kind limestone Sharsumpaint. Beautiful results with a rewarding feeling of self gratification that all is well in the world of creation. Thank you Sharon for the insisted introduction to your paints. I love them, and the future of furniture looks bright. TIP OF THE WEEK: I’m finishing up the “Ombre Desk” set. The desk is finished and I’m working on the chair. Won’t be long now. The desk is in really good shape and the drawers are in great shape, too. They smell just fine. However, I’m into essential oils and I have an oil from Young Living called Cedarwood. I decided I would wipe down the drawers with a mixture of water and about 10 drops of Cedarwood. I thought that might be a perfect scent for a wooden drawer, right? 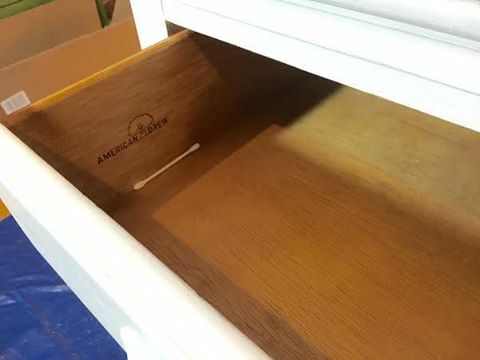 It smelled so good, I put a little oil on qtips and put one in each drawer for awhile. I love opening the drawers and getting a faint whiff of Cedarwood. You might try a favorite scent in the drawers of something you are working on or purchased. TIP OF THE WEEK: I’ve been working on a desk today that will be for sale soon. I am so pumped on how the drawers are looking, I just had to share. 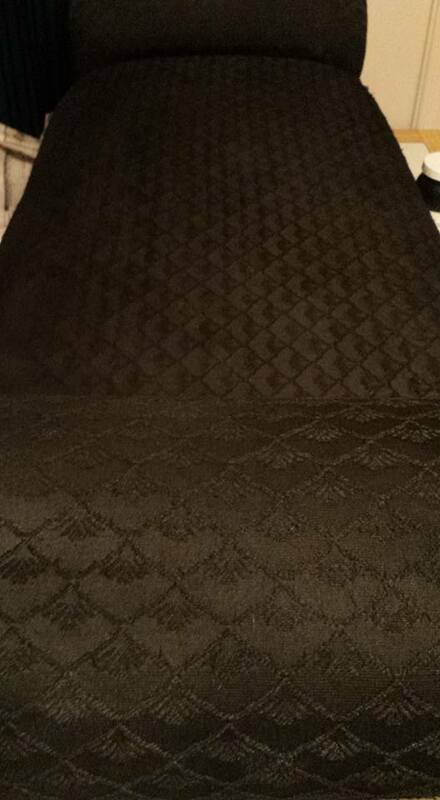 They are finished with 3 coats of poly and they are gorgeous. I’m calling this desk “Gray Ombre” as the drawers are varying shades of gray using Missouri Limestone chalk-based paint. Take a look at the drawer pulls in the original photo and then again in the finished drawer photo. I’ve been painting for a few years now with chalk-based paint. 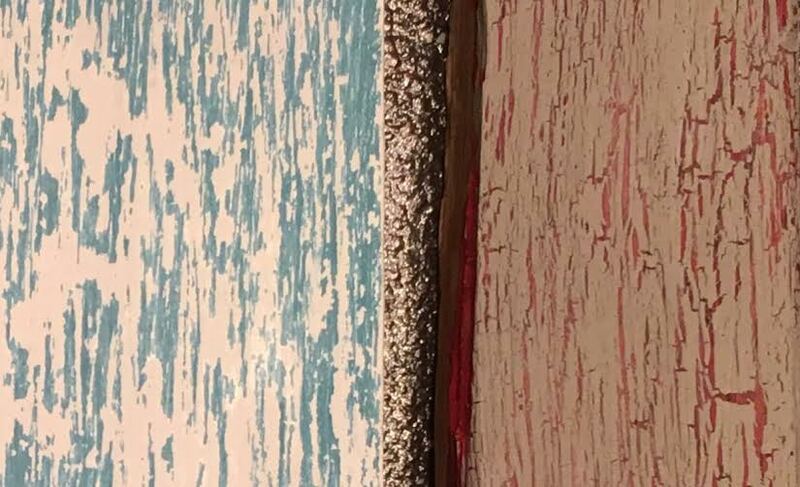 I’ve tried out various techniques for changing the look with different types of distressing, but hadn’t done anything with creating the look of old chipped paint or a crackle finish……until now. Let me say that both of these techniques are easy to do and inexpensive. You don’t have to buy extra expensive products to make this happen! To create both these looks you only need, chalk-based paint (in my case because I love it so much I sell it, Missouri Limestone Chalk-based paint) a candle, some painter’s tape (or duct tape but I like the effect of the painter’s tape better) some good old Elmer’s school glue (yes – Elmer’s glue – any kind works I’m told), a hair dryer, and your topcoat of choice. The steps to creating these looks are easy-peasy, but I like visual step-by-step tutorials and videos, too, and so I will not only give you the step by step directions I used, I will provide the links to the visuals I used also. If you don’t follow the videos of Debi’s Design Dairy you should. She is very informative, easy to follow, and is just plain silly! First of all, here’s a closer look at my completed practice pieces. I will explain below how you can get this look, too. The sample on the left shows the chippy look and the one on the right is the crackle. I painted my sample board with Missouri Limestone Company’s chalk-based paint using “Trading Post”. I let that dry then rubbed it all over with a candle…yep….a regular old candle. Cover the board really well. I brushed off any loose pieces of wax. Then I painted over it with the color “January”. I only used one coat on this, but I think for a thicker, chippy look, two or three coats will give it more depth. I used a hair dryer to speed up the drying time. Final step – be sure to seal your project with your favorite topcoat. In this case, I waxed it. I love this look! Here’s Debi’s Design Diary video I used for this look, followed by my step-by-step. I painted my board with the color “Radio Flyer” and let it dry. You can use the hair dryer here to speed things up. I did….I can’t wait when trying something new. Then, following Debi’s directions, I put a coat of Elmer’s glue all over (I used Elmer’s school glue, but she says any type of glue will work, even the Dollar Store brands). I got it thicker in some areas and thinner in others, and maybe didn’t even cover some of it. Just play around with it. I let it sit for a few minutes to make it tacky, but not dry. Debi recommends working in small sections on bigger pieces and making sure you don’t drip glue all over the rest of your project. Have a rag handy to wipe off drips. The I painted a coat of the color “Zinc” on top, going in one direction only and not going back over. That is very important. If you go over it again, it will not crackle and it will smudge. Using a blow dryer on it at this point will speed up the drying process and help it crack even more. Plus, it is fun to watch the magic happening. Final step – use your topcoat of choice. I waxed mine and love the look! Now, my most pressing questions – what will I paint, what colors will I use, and which effect will I try? I have the answer to one of those….I’m going to try the crackle look on my next project. Wish me luck! We put together this list of tips and tricks on things we’ve learned when painting, waxing and sealing. These are our opinions and what has worked and not worked for us. Others may have had different experiences.